The above copper half penny measures 21.0 mm and weighs 1.22 grams. It was issued in the name of Henry Morrell. Obverse: (rosette) HENRY.MORRELL.AT.YE.LIME , around twisted wire inner circle, H M E inter spaced with three rosettes with two sets of three dots arranged in triangular form below with a fourth rosette in between. Reverse: (rosette) WHARF.IN.HART.HORNE.LANE , around twisted wire inner circle, HIS/ HALFE /PENNY /1667 in four lines plus six dits arranged in an elongated cross pattern within. 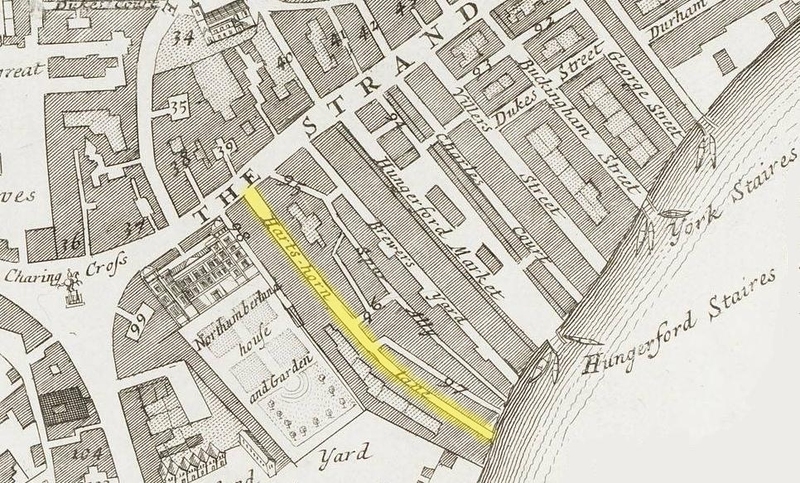 Lime wharf was a but busy wharf on the River Thames at the bottom of Harshorne Lane, which ran south off the Strand to the west of where the present day Charing Cross Station is located. This part of the city was outside of the area affected by the Great Fire of 1666. As yet I’ve been unable to find any record as to the trade or further background details of Henry Morrell or his wife whose name , based on the reverse triad of initials, was presumably Elizabeth? Henry Morrell is not listed in the Hearth Tax records for 1662, 1664 or 1666. However, there is a record of the marrige of a Henry Morrell and an Elizabeth Estridge in the parish registers of St. Gregory by St Paul’s on 12th May 1664.